When I started gripen4canada.blogspot.ca a few years ago, I was convinced that the Gripen NG (now Gripen E/F) would be a much more suitable replacement for Canada's aging CF-18s. Much has changed since then, and I have attempted to broaden my scope to look at other fighter aircraft in order to find the "best fighter for Canada". Anyone following the Joint Strike Fighter's saga over the years knows that it is a troubled program. Despite assertions of progress from both Lockheed Martin and the Pentagon, there is no escaping the fact that the F-35 is still nowhere near the fighter it is supposed to be. My reasoning was simple: How well would the JSF compare to other fighter aircraft if you removed its two biggest Achilles' Heels? These two little rules seemed to have worked. They worked so well that I was actually accused of being biased towards the F-35 by a fairly well established blogger (Don't worry, Eric and I are on good terms now). Mission accomplished. Unfortunately for the F-35, the handicapping has not been enough. When compared directly against other fighter aircraft, it has almost always disappointed. Its only "win" thus far has been against the Super Hornet, and that was by a slim margin. The JSF's stealth has certainly helped it, and there is no arguing its versatility, but its compromised design results in it falling behind other aircraft's performance. The Gripen? The feisty little Swede performance in FJFC has been rather anti-climatic. Its FJFC record of 2:2 make it seem rather mediocre. In many ways, it simply cannot compete with larger, more powerful aircraft like the Typhoon or Silent Eagle. Then again, the same rules that help the F-35 end up hurting the Gripen somewhat. By ignoring cost, we cancel out the Gripen's most endearing aspect. Keeping that in mind, how well does the F-35 compare to the Gripen when everything works and cost is no object? Let us find out! Interdiction/Penetration: The F-35 has always won this category. As the only true "stealth" fighter available, it simply dominates here. Other aircraft can be fitted with ECM or other radar evading techniques, the fact remains that the F-35 will be the hardest to detect. Even if modern radar technology makes the JSF's stealth less relevant, it will still have an advantage over less stealthy aircraft. Deep Strike: The F-35 carries 50% more internal fuel than the CF-18. Its proponents often bring up the fact that it has no need for external tanks. What they neglect to mention is that the JSF cannot carry external tanks. External tanks have been envisioned and even tested in the wind tunnel, but "separation issues" have scuttled the possibility of an extended range F-35 for the foreseeable future. The JSF has a range of 2,220km. It should have the capability of mounting the 1,000km+ range AGM-158B JASSM-ER ALCM, however. This would greatly enhance its effective strike range. Both aircraft will have their range reduced somewhat by carrying external stores. Big missiles (for both) and big tanks (for the Gripen) add a lot of weight and drag. Things get even fuzzier when you consider that the F-35 may not even get the JASSM anytime soon, merely "eventually". Given the Gripen's ease of weapon integration, the JASSM-ER certainly does not seem out of the question for it. Close air support: Much has been said about the A-10s retirement in favor of the JSF taking over its close-air-support role. So much, that it does not need repeating here. What does need to be said is that the F-35 is a fragile aircraft, incapable of withstanding small arms fire. In order to perform close-air-support, it flies high above the battlefield and uses its EOTS to find targets. When a pilot cannot put their own eyes on a "danger close" target, bad things can happen. While the Gripen is no A-10, it does have some impressive close-air-supprt capabilities. Being a close-coupled-canard design gives it impressive low-speed handling. The Gripen also tucks away a heat exchanger and exhaust vent right behind the cockpit. This keeps the aircraft's IR signature down and improves survivability against MANPADS. The Gripen is also capable of operating from austere conditions, allowing it to be based much closer to the action. It even has an impressive close-air-support weapon selection, which includes guided bombs, rocket pods, and the Brimstone missile. First look, first kill: With its stealthy shape and advanced sensors, the F-35 can dash through the air akin to some sort of "sky ninja", taking its opponents out unseen like a shadow in the night. That is what the JSF marketing seems to imply, anyway. The truth is that the F-35 has a slightly-above-average radar (the APG-81) and the equivalent to an IRST (DAS) built into a airframe that just so happens to offer a smaller RCS than most. It is still quite visible in the IR spectrum. With no faceted "stealth" design, the Gripen's RCS is larger than the F-35's. The Gripen likely has a smaller IR signature, however, due to its smaller engine and less draggy shape (drag=friction=heat). As for radar, the Gripen's ES-05 Raven AESA array is roughly the same size as the F-35's but it has a swivel plate than enables a much wider field of view. 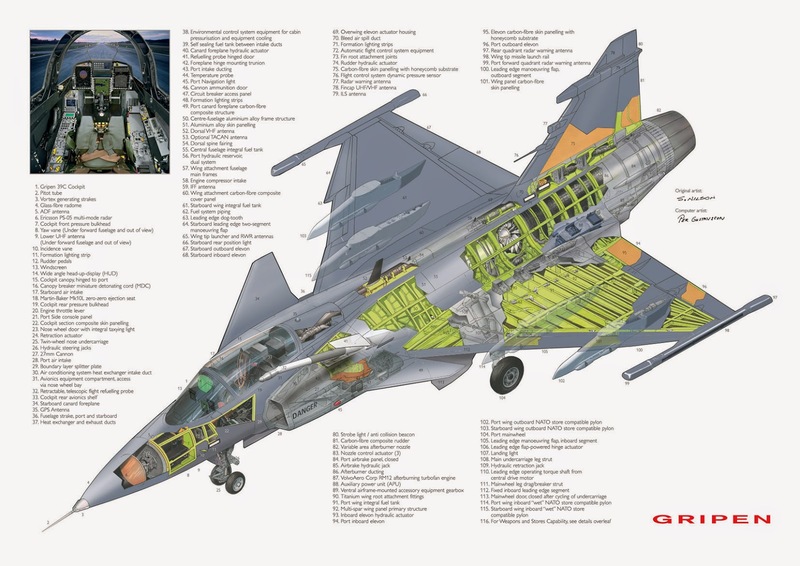 The Gripen is also equipped with an IRST. Beyond Visual Range: The F-35 carries the well known AIM-120D AMRAAM inside its weapon bays. While "the specs" list a range of over 180km, the actual useful range is much lower. Especially against an opponent with RWR (radar warning receivers), a skilled pilot, and countermeasures. If the missile is fired too far away, it can be easily outmaneuvered. If the F-35 gets too close, it can be detected by IRST or possible even radar. Complicating matters is the AMRAAM's actual combat record. Since its adoption, the AMRAAM has shown a pK (probability of kill) of less than 50%. Those targets had no countermeasures, were not maneuvering, nor were they even engaging the firing aircraft. One was a friendly fire incident. If the JSF pilot wants a realistic chance of bringing down the Gripen, they will have to get uncomfortably close to being detected. If the Gripen's pivoting AESA radar, IRST, and radar warning receivers (RWR) pick up the F-35's approach... All bets are off. With is ability to supercruise and a faster dash, the Gripen has the speed to outrun the F-35. It also carries the MBDA Meteor missile, which has a much larger "no escape zone". Within Visual Range: The F-35's stealth advantage completely disappears in a WVR scenario. Its big, hot engine is easily visible to IRSTs and heat-seeking missiles. The JSF does have the most advanced helmet mounted display (HMD) on the market and its DAS (distributed aperture system) gives it a true 360° view around the aircraft. The real kicker would be whether or not the F-35 is carrying WVR missiles. When in "stealth mode" the JSF carries 2-4 AMRAAMs internally. Any IR guided missiles need to be mounted on stealth-robbing external pylons. Yes, radar-guided AMRAAMs can be used at WVR ranges, but IR guided missiles (like the AIM-9X Sidewinder) have a higher probability of kill (pK) as well as faster "lock-on" times. Dogfight: When specifications were being written for the Joint Strike Fighter, planners must have forgotten the lessons learned over Vietnam. The dogfight was considered "obsolete" thanks to the age of guided missiles. American pilots soon realized that guided missiles did not work as advertised and that a gun is very much a necessity. The F-35A has a 25mm gun, but the B and C models do not (a gun pod is being planned). The JSF also suffers from poor visibility and is unlikely to withstand much damage, thanks to the removal of fire suppression gear to save weight. The Gripen is equipped with a 27mm cannon on all single seat models. It is an excellent performer at low speeds and high angles of attack. Its smaller size makes it a harder target. It does lack a true "bubble" canopy, but the only blind spots are the frame and at the very rear where the pilot's head cannot turn anyway. The single, vertical tail also blocks the pilots view far less than twin canted tails do. Versatility: As much criticism as the F-35 receives, few have complained about its lack of versatility. Quite the opposite. The JSF's very raison d'être is to be whatever you need it to be. It can perform air-superiority, strike, reconnaissance, and plenty of other duties. If needed, there are STOVL and CATOBAR capable versions available. It lacks a two-seater version, however, an omission that limits its use for training and high-workload missions. The F-35 is also quite proprietary in its design. Users who wish to add their own weapons or perform modifications to the hardware or software need to do so with the Pentagon's and Lockheed Martin's permission. 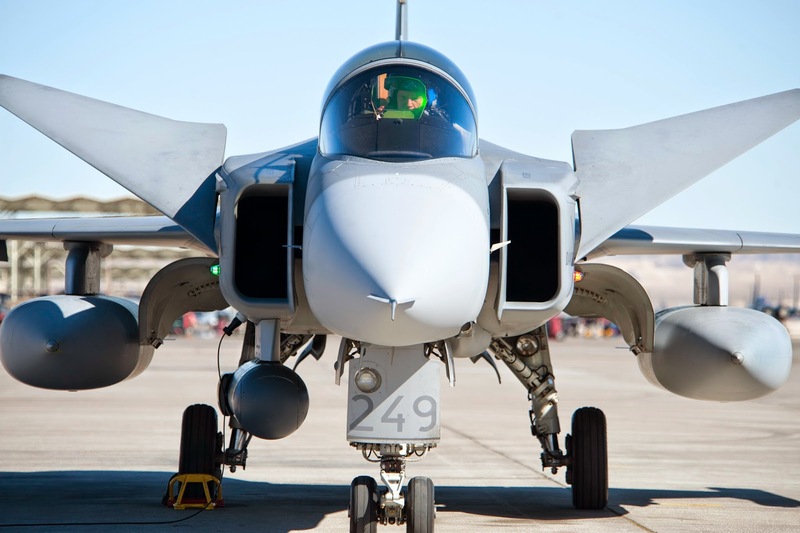 The Gripen is equally comfortable performing air-superiority, strike, or reconnaissance missions. It lacks a STOVL version, but a CATOBAR capable "Gripen-M" seems increasingly likely. The Gripen is also much more "open source", offering full technology transfer and easier weapon integration. Logistics: Even if the F-35 does not sell at original estimates, it will be built in the thousands and see use all over the world. Parts should be plentiful and there should be no lack of qualified technicians. The aircraft's stealth characteristics complicate matters somewhat, however, as it requires additional security and other special considerations. Australian documents suggest that the F-35's radar absorbent skin can be damaged if left in direct sunlight too long. Cold weather testing has yet to be done. 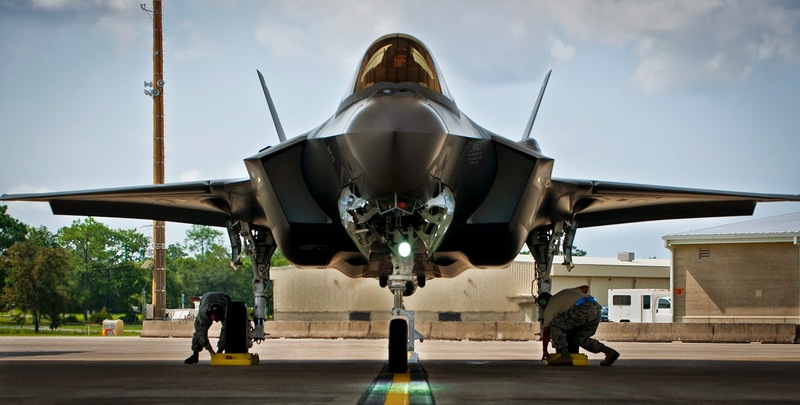 The F-35A also requires at least 8,000 feet (preferably 10,000) of runway to take off and land safely. Austere airfields need not apply. While the Gripen will never likely reach JSF-like sales, it does see service around the world. It is especially popular with smaller air forces on a fixed budget. Weather conditions do not seem to be a factor, as it sees use everywhere from Sweden's arctic to Thailand. Maintenance is made easier by easy to access systems utilizing plenty of "off-the-shelf" parts. A team of six can refuel and rearm a Gripen within 10 minutes. Not only that, but the Gripen can operate from a mere 2,400 feet of straight highway, and get serviced from a truck. It is the farthest thing from a "hanger queen" a modern fighter can get. Both of these aircraft were envisioned as affordable single engined fighters that could perform multiple roles effectively and efficiently. Yet something seems to have been lost in translation with the F-35. It simply tries to do too much. 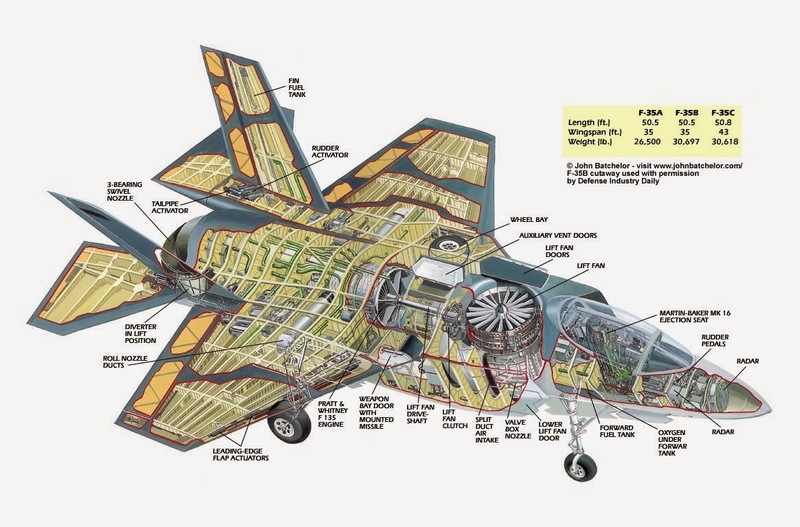 Whilst the JAS-39 takes a more minimalist approach, the JSF takes on a substantial amount of "feature creep". Not only is it a multirole fighter, but it needs to make compromises for stealth, STOVL and CATOBAR capability. Anyone with the slightest amount of engineering skill could tell you that there are no "free lunches" here. All these extra features result in increases in cost, weight, and complexity. More worrying about the F-35 is its complete and utter dependence on stealth. Without this advantage, it becomes rather unimpressive. Its performance is roughly equivalent to Canada's current CF-18 with upgraded avionics, but without the capability of operating from shorter airfields. While the Gripen may lack the payload and stealth of the F-35, it can still perform a variety of strike mission effectively. Some missions, like close-air-support, are more suited to the Gripen. In the air, the Gripen makes up for its perceived stealth deficit by being faster, more agile, and mounting better missiles. If that was not enough, it can operate in less-than-perfect conditions and its simple to maintain. Its faster and more maneuverable, yet still cheaper to operate. It may not be the best aircraft for heavy bombing or "first day of war" operations, but it is fully capable of meeting an air forces needs otherwise. Before taking costs and reliability into account, the Gripen is still the more useful aircraft. Once costs are considered, things become even more lopsided. The JAS-39's operating costs are estimated to cost ¼ that of the F-35. There is serious doubt over whether the USA can even afford the F-35's high operating costs, as the JSF costs more to operate than the aircraft it replaces, including the F-15C. More worrying is that many parts need to be replaced 15-16 times more often than anticipated. By sticking to the basics, the Gripen proves that a modern multirole fighter can be effective and affordable. In a way, it is the antithesis to the F-35 Lightning II and all its problems. And so goes the last bout of Fighter Jet Fight Club. There will be one final installment that will attempt to make sense of the whole thing, coming soon. Until then, as always, feel free to comment. Labels: F-35, Fighter Jet Fight Club, FJFC, Gripen, the finale!